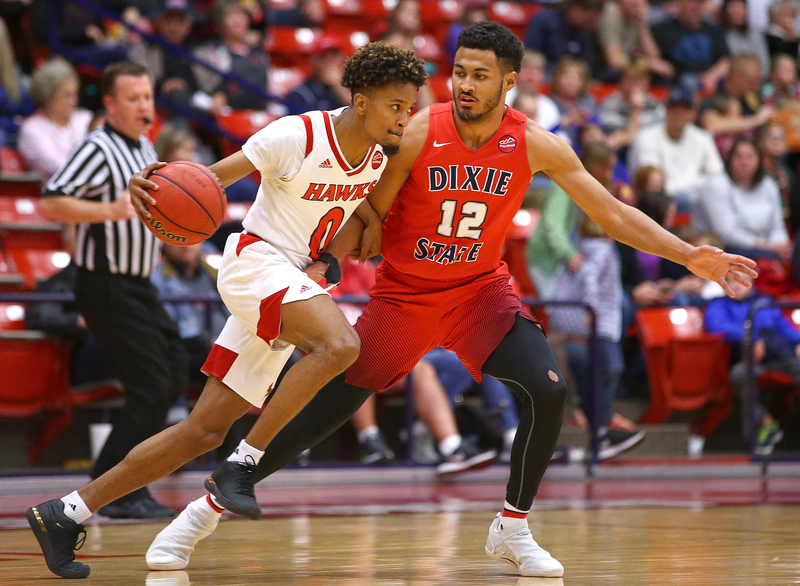 ST. GEORGE – After sub-par games Saturday night, Dixie State senior stars Brandon Simister and Trevor Hill came out Monday and helped the Trailblazers win their 13th-straight game with a 99-76 walloping of Holy Names University in Burns Arena. Simister and Hill, who each average 15 points a game, combined for just 12 points on 2 for 14 shooting on Saturday. Things were very different on Monday against the Hawks. Simister had 25 points on 7 for 9 shooting and Hill scored 18 on 8 for 11 shooting. 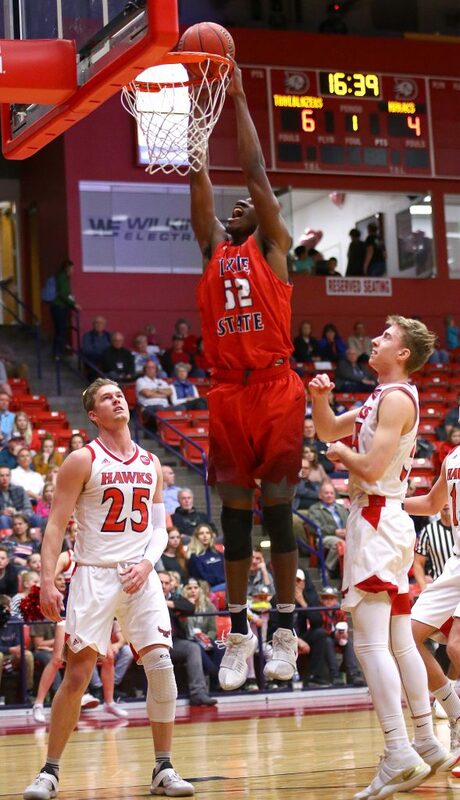 Simister tied a Dixie State Division II-era record by making six 3-pointers. 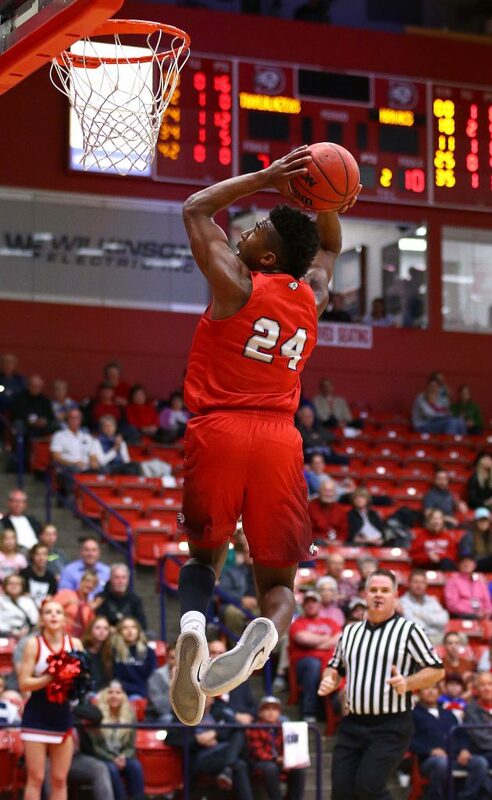 Hill had two of the more impressive dunks of the year – an alley oop to open the second half and a breakaway 360-jam that brought the Burns Arena crowd to its feet (and made No. 8 on ESPN’s Top Plays of the night). Hill said being seniors, with a lot of experience to draw from, helped a lot. Holy Names must’ve been wondering what hit them as the Trailblazers were hot all night. After going 14 for 28 from the floor in the first half, DSU shot a blistering 70 percent after intermission making 19 of 27 field goals. Simister was the hottest of them all, making six of the seven 3-pointers he attempted. 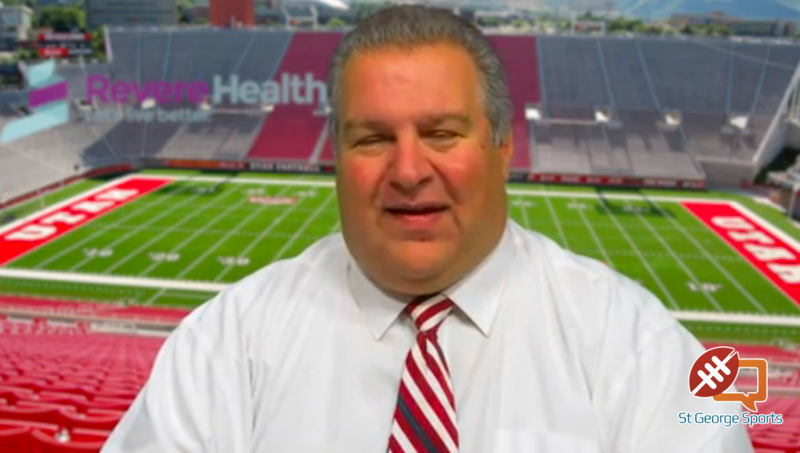 Understandably, Simister was a bit melancholy about playing his final game in Burns Arena. Hill, who passed Kimball Payne as the all-time assists leader at Dixie State, had seven dimes in the contest. 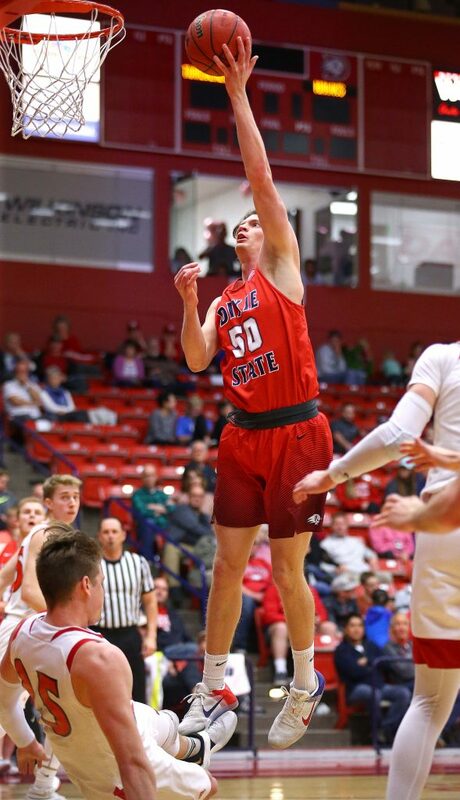 The record now stands at 399 (Payne had 395), with DSU still having two more regular season games, plus the postseason. 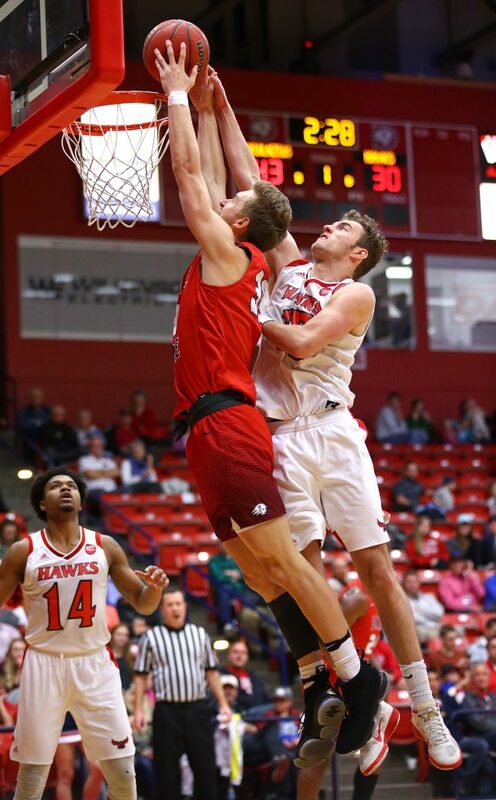 Hill opened the game with a driving layup, but Jacob Dean put the Hawks ahead with a 3-pointer and the game stayed close for the next 10 minutes. A Dean free throw pulled Holy Names within 20-18 with 10:10 to go in the half. 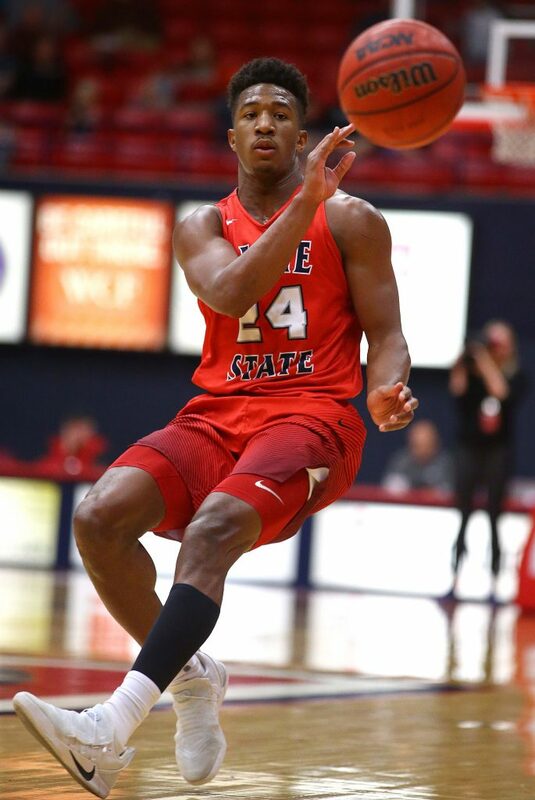 It was still a five-point game with 5:46 to go in the first half when Dixie State started going deep. Simister hit a trey from straight on to make it 35-27 with 5:25 to go. After a steal by senior Daylor Youngblood, another senior, Zac Hunter, buried a trey to make it 38-27. HNU tried slowing DSU down with a timeout, but a missed trey led to another Simister deep ball and Hill followed that with a breakaway jam. Just like that, it was 43-27 with 3:43 left in the first half. 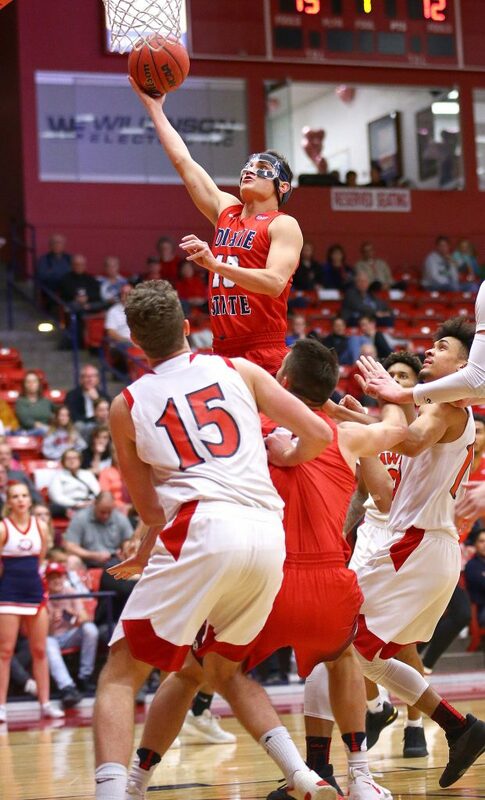 Kyler Nielson, another senior, opened up the second half with a perfect alley-oop pass to Hill just seconds after halftime. The massive throwdown made it a 20-point game at 53-33. With Simister on fire from outside and Hunter and Isaiah “Slim” Clark dominating the paint, the lead grew all the way to 80-53 as the clock ticked under 11 minutes. Judkins finally pulled his seniors out of the game for good with five minutes left and the crowd applauded Simister, Hill, Youngblood, Hunter, Clark and Nielson. 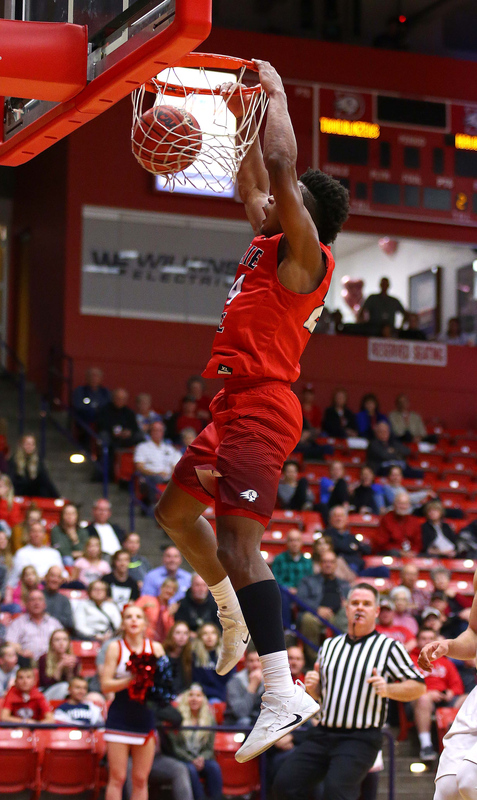 Along with Simister’s 25 and Hill’s 18, Hunter chipped in 12 points and had 10 rebounds. The Trailblazers finished 33 of 55 from the floor (60 percent), including 11 of 21 from beyond the arc. 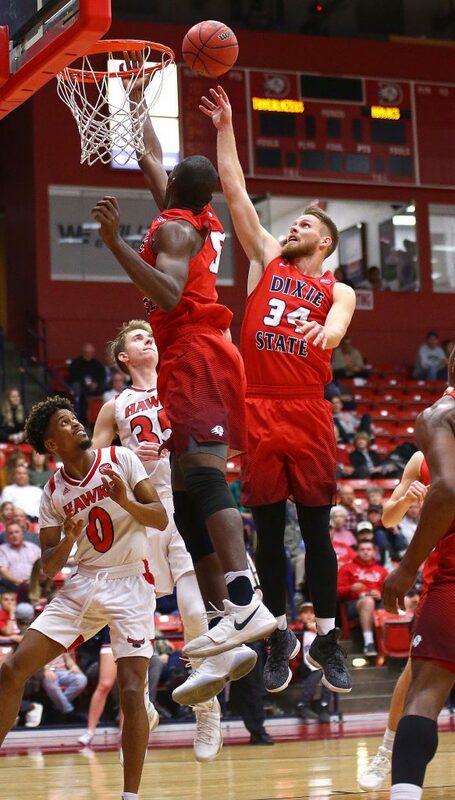 DSU also outrebounded Holy Names 32-26 and had five fewer turnovers than the Hawks (17-12). The Blazers (19-6 and 16-2 in the PWC) maintain their first-place standing in the PacWest (see standings below) with the win and have two games left. 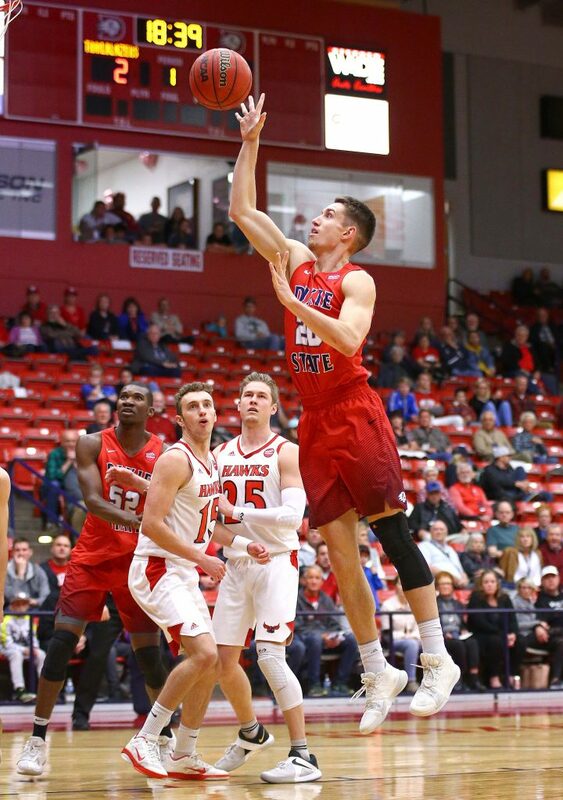 DSU plays Biola (5-14) on Thursday night and then concludes the regular season with a road game at Point Loma (15-4), which is currently 1 1/2 games behind DSU. 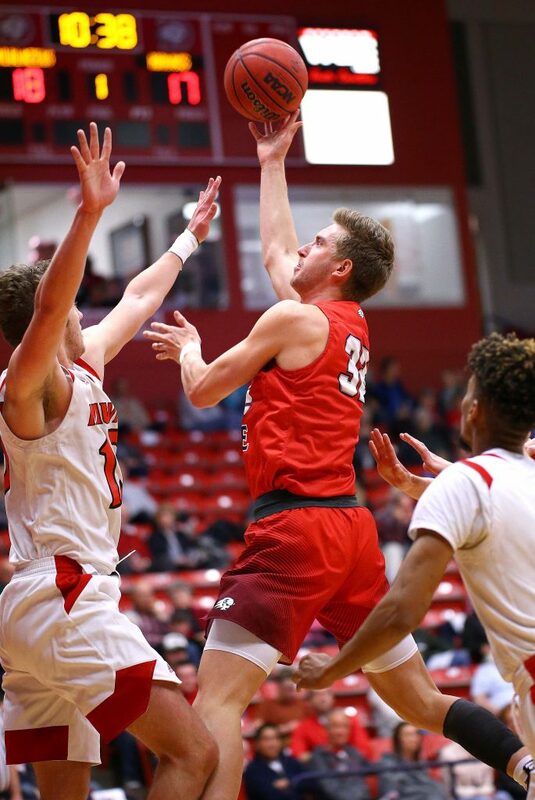 Holy Names (11-19, 7-12), which was eliminated from any postseason playoff contention with the loss, was led by Jamie Strong, who had seven 3-pointers and finished with 23 points. Alonzo Taylor scored 21. 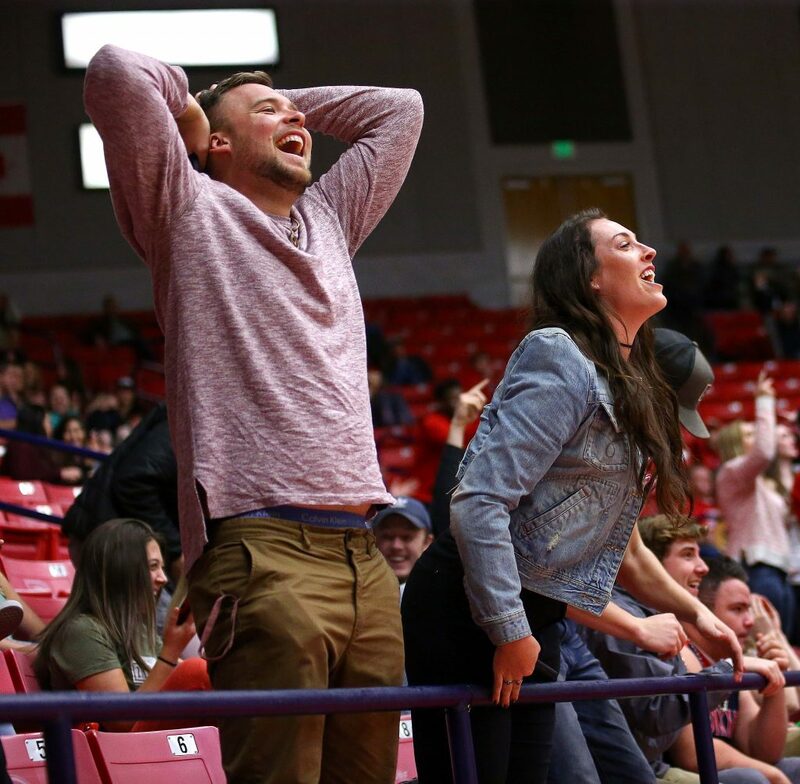 The Dixie State women’s basketball team honored its four seniors prior to tipoff on Monday, then sent them out in winning fashion with an 87-50 triumph over Holy Names on Senior Night inside the Burns Arena. The Trailblazers (12-13, 8-10 PacWest) never trailed in the contest, outscoring the Hawks in each quarter on the way to recording their largest margin of victory this season for the second time this month. 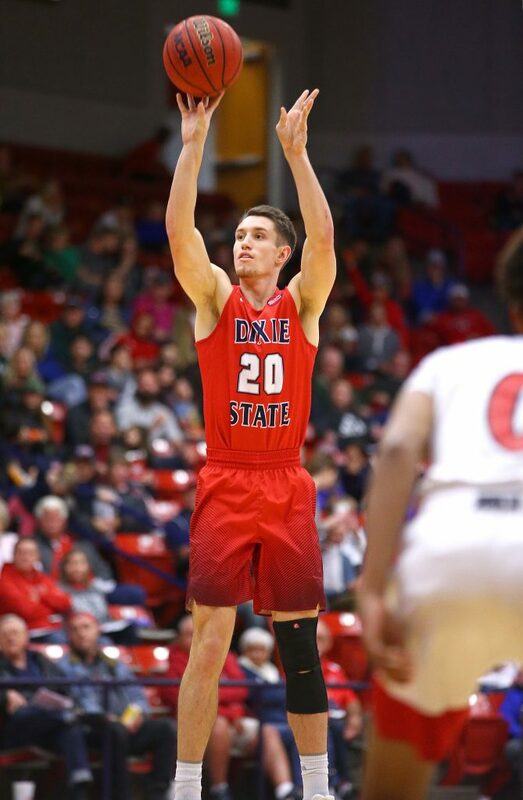 DSU also converted on 13 of 30 3-point attempts, marking the second-most 3-pointers made this year. 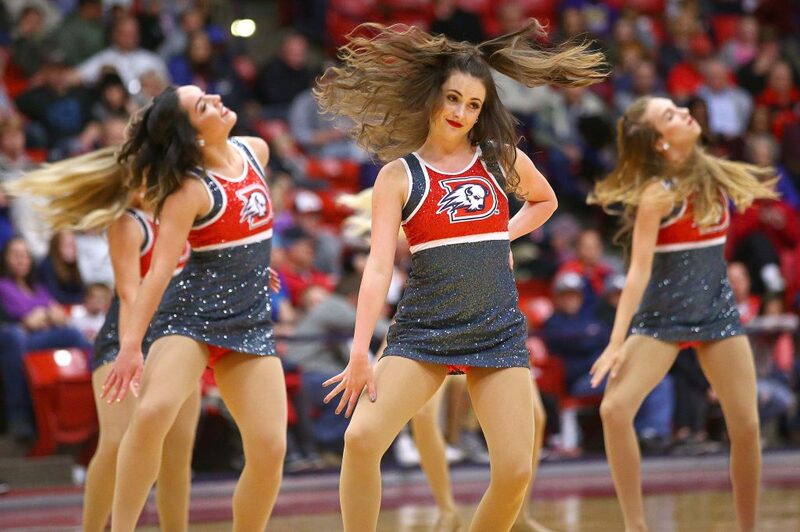 Dixie State raced to a 9-0 lead less than three minutes into the game when Matti Ventling, Gabrielle Cabanero, and Keslee Stevenson each buried a triple to set the tone for the night. Holy Names countered with five consecutive points, but DSU responded with a 7-2 run to build a 16-6 lead. Maile Richardson scored five of the seven points during the stretch. The Trailblazers enjoyed their highest-scoring quarter of the night in the second frame, outscoring the Hawks 26-12. DSU forced 11 HNU turnovers during the quarter and turned those turnovers into 10 points. Taylor Moeaki scored six points during the stanza, while Ventling and Mariah Martin added five points each to help build a 42-21 halftime lead. 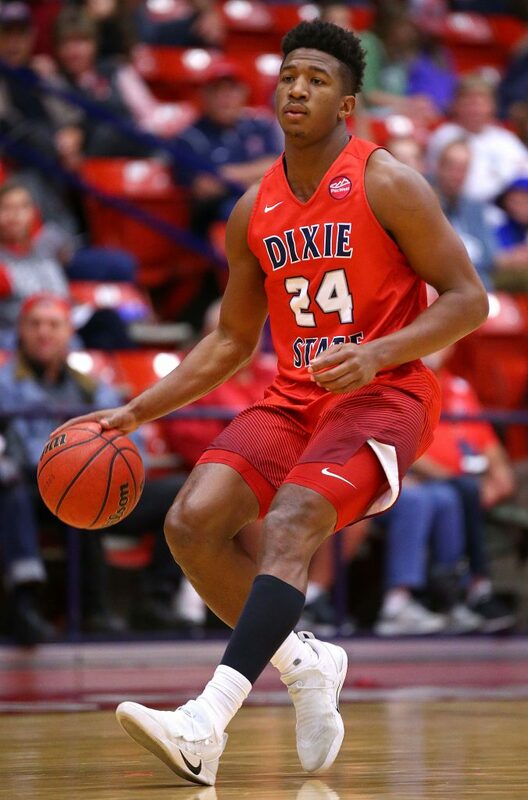 Dixie State opened the third quarter with a 10-2 run to extend the lead to 52-23 at the 7:01 mark. Cabanero scored on back-to-back layups during the run, while Ashlee Burge and Moeaki each added a layup. 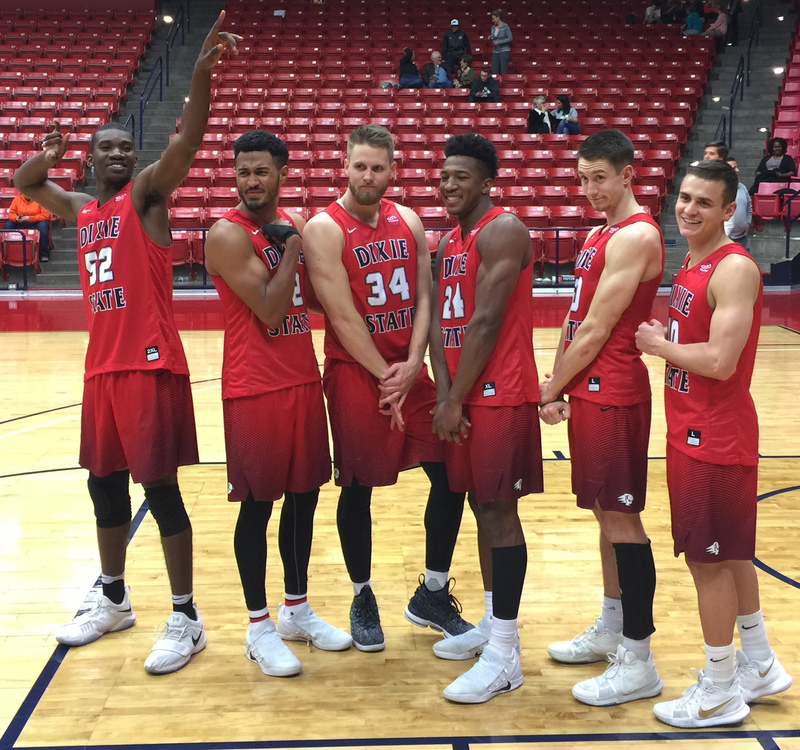 The teams went back and forth for the final five minutes and DSU took a 63-36 lead to the fourth quarter. The Trailblazers used their second-quarter performance as a blueprint for the fourth quarter, outscoring the Hawks 24-14 in the final frame. 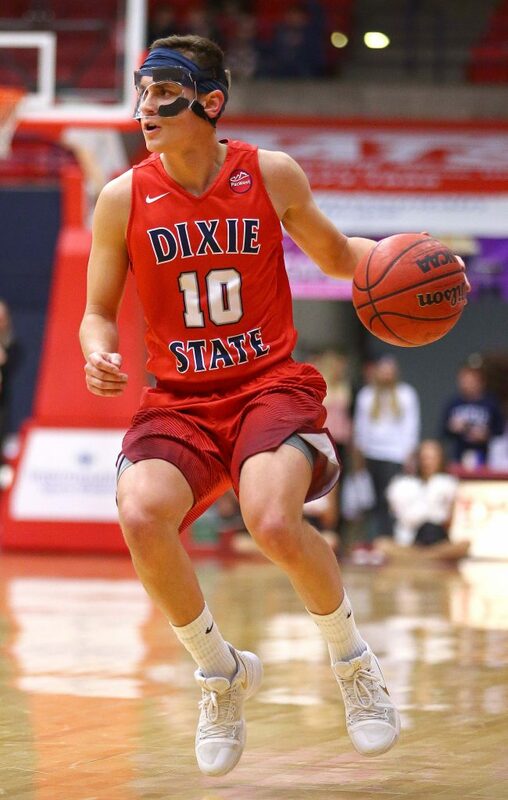 Dixie State shot a blistering 53 percent (8 of 15) from the field in the quarter and buried five triples. Ventling accounted for three of the fives 3-pointers for nine points during the stretch, while Morgan Myers buried the other two treys to help seal the 87-50 victory. 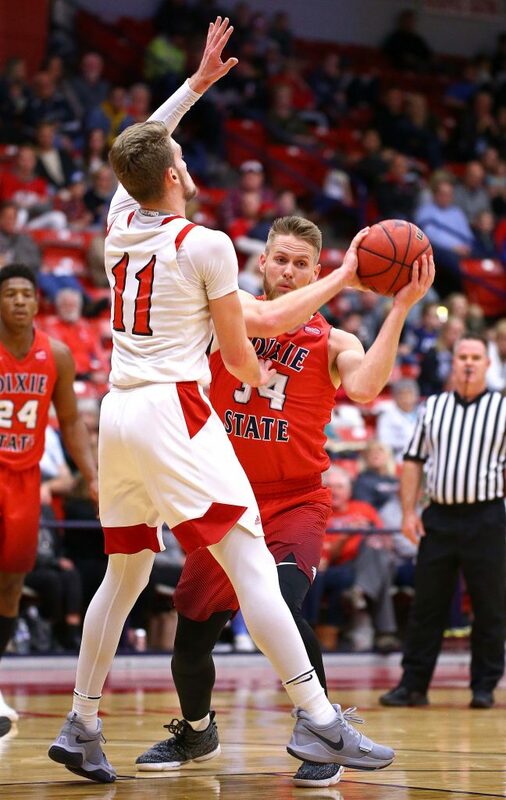 Dixie State shot 40 percent (30 of 75) from the field, 43 percent (13 of 30) from 3-point range, and 70 percent (14 of 20) from the free throw line. 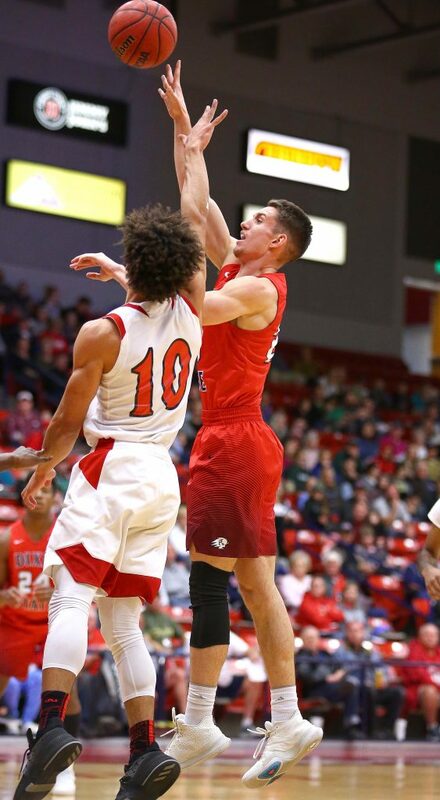 Ventling led three DSU players in double figures with a game-high 17 points on 5-of-7 shooting from outside. Ventling also added 10 rebounds for her second double-double of the season. 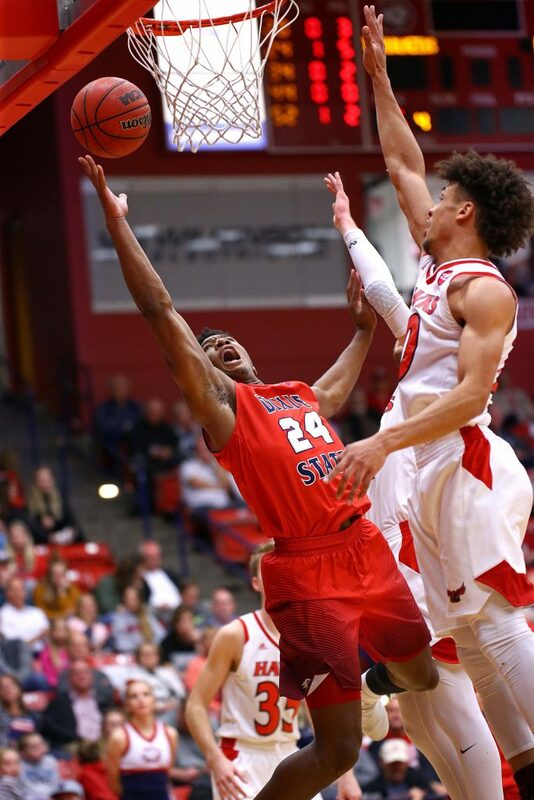 Moeaki added 14 points, while Stevenson chipped in 10 points. Burge finished with six points and a game-high 14 rebounds, while Cabanero recorded a season-high eight points. The Trailblazers now head to southern California for their final road trip of the season at Biola on Thursday and Point Loma on Saturday.